Perforated metal U-Edging is a metal wire mesh product accessory. It is a metal u-shaped strip attached to the edge of a wire mesh product to make the edges more attractive and uniform. It provides a safety barrier at the cut edge of the sheet covering sharp cut edges. U-Edging is easy to install and long lasting. It is available in carbon steel, stainless steel, aluminum and galvanized steel. Our perforated metal U-edging is available in carbon steel, stainless steel, aluminum and galvanized steel. 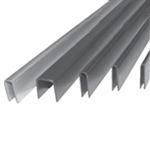 Direct Metals also offers U-Edging in cut to size lengths.